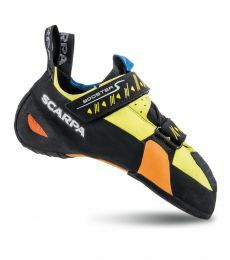 The Scarpa Booster S is an ultra-light climbing shoe made for the advanced boulderer and sport climber. This shoe is designed to be nimble, dextrous, and precise, for fast-moving on hard problems, with an extremely sensitive design and soft midsole only intended to be tamed by the technical connoisseur overhanging and steep routes. Powerful and precise as they come, strong feet are a prerequisite for the Booster S. 3.5 mm of rubber is about the thinnest sole you can get on the market, and none of this sensitivity is impaired by a desensitising lining. You'll be able to feel every micro hold, every tiny crystal, and every subtle but useable feature on the rock and use it your advantage. Vibram XS Grip2 rubber is designed for maximum friction so you can easily grip onto far-away holds and maintain body tension whilst horizontal. And the Tri-Tension randing system has been designed for unimpeded power, driving the the foot's forces through the toes and onto the hold. Just about every feature to make the horizontal feel more like the vertical. When sizing the Booster S, bear in mind that the unlined microsuede upper will offer the minimum amount of stretch. Scarpa have also designed it to be fit snugly for the highest performance fit. If you're looking for a more all-round high-performance shoe, try the Boostic. A rand designed for point-precision shoes, the Tri-tension rand enhances powerful movements through dynamic problems by concentrating the strength of the foot through an asymmetrical support ribbon, driving energy to the forefoot. I've been pretty loyal to Scarpa over the years but was a little nervous changing the model Im used to(vapour v). I read that the booster was especially good for bouldering, which is not my favourite sport as I'm mainly on the walls.. I took a gamble anyway and ordered the boosters..
Firstly putting them on is a joy, they're more comfortable than Marty McFlys mags in part 2.. They hold together very very well with the velcro and grip onto almost cigarette paper thin holds. Really happy with the purchase, which I have to add was delivered extremely quickly and was the best priced I found.. Thumbs up epictv!! Just bought my fourth pair of these. Great sensitive shoe that puts out nice power on the big toe. Really precise! Buy them a bit tight and they will stretch to perfection. The only down side is that they wear out pretty quick. The rubber on the edge of the big toe starts peeling off at some point. I’ve had this problem on two different pairs. Would buy them again though because the fit and performance is top class. Great for bouldering and overhanging hard sport routes in and out. It's the first time that I bought more sensitive shoes than the typical hard soled and padded ones that we use for traditional climbing and long routes. When they arrived they seemed pretty tight for 1.5 size smaller than may regular fit. Once on the boulders and indoor climbing they were directly a great fit, and what an accuracy in the tow and heal. Scarpa knows how to make shoes for sure. It added a grade to my climbing skillset. From all the scarpa shoes this one is my favorite. It's got the sensitivity of a slipper but because of the velcro's you don't have to worry that the heel will slip off. Although soft it has quite a lot of edging power. Fit: I downsized 2.5 sizes in the scarpa stix and 2 sizes in the Scarpa booster S because they are more like a shoe than like a slipper. They stretch quite aa lot (around half a size) but are comforable after only one session. It`s a excellent shoes for climbing steep terrain or for plates. You can stand on really , really edges or the opposite on inclined ramps like it would be nothing. The only minus it`s a relative soft shoe , so it`s not the best shoe for very long routes. Bought this shoe based on online reviews about the softness and sensitivity. Though not as soft as the furia, the toe box is sensitive and the heel fits nicely without coming off during high torsional moves. The inside of the shoe is lined with microfiber so it is comfortable right out of the box, only took me 1 session to break into them. Definitely would recommend it to people looking for a high performance grip rubber shoe.